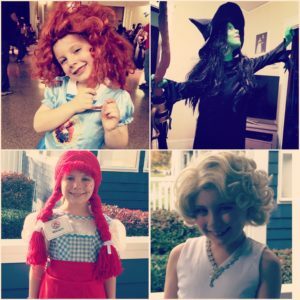 For the fourth year – every year he has been in his large Boston public school – my fourth grade son attended the school Costume Party in a “girl costume.” In first grade it was Princess Merida, in second grade he was Elphaba from Wicked and last year he was Wendy (from the hamburger chain). This year he wore a white dress and blonde wig and was Marilyn Monroe. I’m not writing about how our family chooses to accept our son for who he is, which we always have and always will. I’m writing this to say thank you. My husband and I insist our kids write thank you notes for gifts and kind gestures. So this is my thank you note to those who every day accept and love our son and allow him to be who he is. We are thankful for his school. It is a place where all kids are welcome. It is a wonderfully diverse place- different races, religions, ethnicities, socio-economic levels and family make ups. Kids are kids and challenges are used as teaching moments to instill “Doing the Right Thing,” as their school calls it. We are fortunate that the school has the resources that engage all students. For my fourth grader having art and dance and music during the school day makes going to school fun. While they do have uniforms my child finds ways of adding metallic high tops to accessorize. He also brings a mint green and pink back pack and a pink lunch bag to school. While he’s been questioned about his choices, he’s never felt the need to compromise his favorite colors and personal style. We are thankful for his teachers who treat him with kindness and respect. They enforce all the good things we love about his school. They celebrate differences. He trusts them. It’s not just in the classroom, it’s about everyone. It’s the lunch lady who doesn’t question that he only wants to sit with the girls, the teachers he’s never had coming to see him in a show and the principal who tells him stories about family members seeing Hamilton stars. We are thankful for his classmates and their families. There have been kids in other grades, and even kids in his class at the beginning of the school year that questioned my son’s love for talking about hair styles over super heros. I have seen them accept him, welcome him and defend him- a complement to their families. His friends posed for pictures during the party and adults and kids complimented him on his costume. His smile lit up the room. But where did my son’s confidence come from? Who are the people he looks to and sees as role models? His theater friends. We are so, so thankful for his group of friends. His theater friends include kids his own age and kids in high school, and adults he has been in shows with and production staff members. He calls them all friends. It’s always a surprise when we meet a friend he has been talking about and the friend turns out to be not another fourth grader. He is treated as an equal and he in turn treats everyone as an equal. Just before first grade, while in a show with middle school students, my son became friends with three older boys. They told him his pink lunch box was cool. They sang the same show tunes with him. They made him feel like one of them and invited him to sit with them at lunch. The short blonde wig with curls that inspired this year’s Marilyn Monroe costume came from a theater friend- a grown up friend playing his dad in a show this past summer. My son was singing songs from musicals set in the 1920’s and he thought my son might like it (more like loved it). After weeks of singing Hamilton songs during a show rehearsal, a fellow cast member somehow found a way for a short birthday message from a couple of Hamilton cast members to be recorded for our son’s birthday. He couldn’t contain the excitement of telling everyone it was the best part of his birthday. Acts of kindness like this happen in his world. For those acts- the conversations about other shows he loves to hear about, the backstage sing-a-longs, the cards and kind messages, hugs of congratulations and interest in his fourth grade life- we are thankful. And of course our family- the grandparents, aunts and uncles and our friends who sit through the shows, smile when he has another story, hem his Marilyn Monroe dress and love him no matter what, we are eternally thankful. There are no words to describe the love of his older brother- his protector, co-conspirator and partner in crime. Our son is in his element in his theater world telling stories, being characters and creating other worlds. We joke that Halloween and costume parties are high holy days for a kid like ours. Because of so many wonderful people for whom we are eternally thankful our son can enjoy his favorite holiday. This year in his white dress and blonde wig as Marilyn Monroe. This entry was posted in Brendan News, Family News by Nicole. Bookmark the permalink.